We were able to sail almost the entire way this leg which was a welcome change after a 11 day motor last time. We did turn the engine on for the last day or so as the wind died down to almost nothing, the water looked more suited to canoeing then sailing! I stood night watch from 00:00-02:00 near the beginning of the sail. Lots of stars and nothing too eventful. Had a quick snack and went back to bed after. One of calm day the crew set up our pool on the main deck. 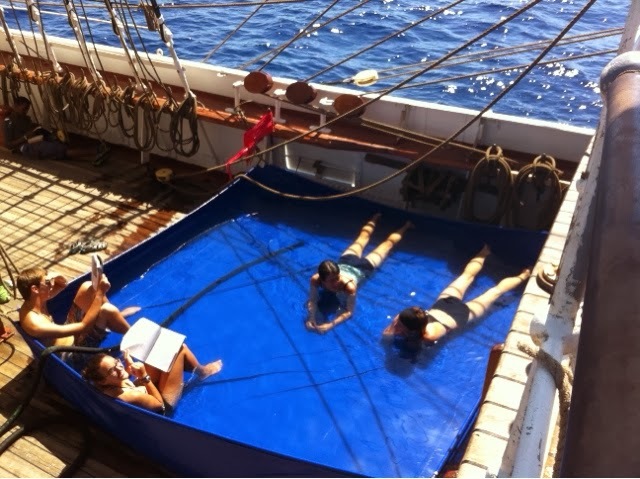 Captain Bjarke made it last semester and though it's more for wading then swimming it was nice to cool off and how fun to have a pool on a tall ship! One of the classes that afternoon took place in the pool! On Sunday we had our first No Power Hour of the semester. The engine and generator were both turned off and although the emergency and navigational lights were on (backup battery) all was quiet and beautiful. Most everyone came up on deck and little groups of people were sprinkled around relaxing and enjoying each other's company. During this time the engineer gave tours of the engine room. I only went for a short time but I saw our water makers (we have 2) that can each produce 6000 litres of water a day by removing the salt from the sea water. The water is also passed by a UV light so by the time we drink it it's quite clean. There were a couple whale sightings, humpback and we think pilot. Unfortunately I missed seeing the humpback jumping but I saw the spray from its blowhole. The pilot whale got really close to the ship, you could see its white body about 20 feet away and I also caught sight of a fin! Remember when I said we'd done our last gain an hour time change? I was wrong! Although we were at our furthest west point then I forgot we'd be zigzagging east to west a bit. This time we changed time during the day so everyone got an hour extra of daytime rather then an extra hour of sleep. So all those times you wish you had more time in the day? On a ship you can make that happen! More drills this sail. This time the situation involved a collision, a fire, 3 injuries and ended in abandon ship. I had the job of staying with one of the injured (she lost a thumbnail). I was reminded of my winters stuffing toddlers in snowsuits when it came time to help her into her life jacket! Found a week old Vancouver Sun (possibly my favourite paper) and Globe and Mail in the crew mess. It was probably the most excited I've been to see a newspaper! There was an Olympic section which was fun to read even though I'd heard all the Canadian results. We caught our first fish this sail. First a barracuda which bio used for dissection and then a mahi which we ate for dinner the next day (everyone got a bite). 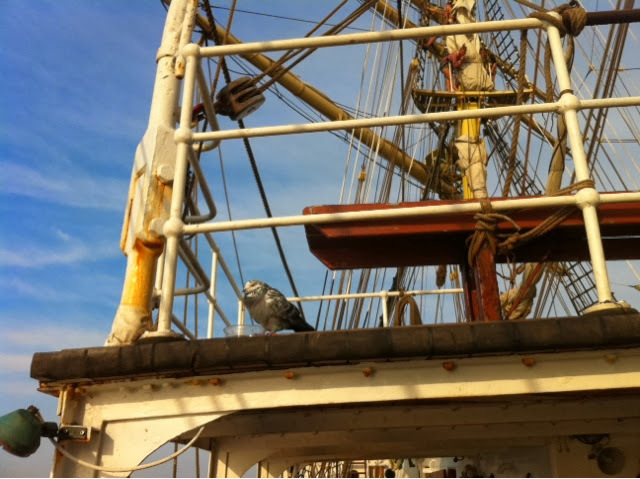 In other wildlife news we had a pigeon on board for the last bit of the sail but no plans to eat it. The last night before we reached Havana we were at anchor within swimming distance of the port. We had a BBQ and no power hour after but it wasn't quite as peaceful as the first one due to the light and noise from the city and the dance lessons taking place on deck! Arrival morning was quite exciting as Havana is a parent port and most of the students had family waiting for them on the quay. Although we didn't have far to go from our anchorage we did it in fine style with students dressing the yards and singing sea shanties. 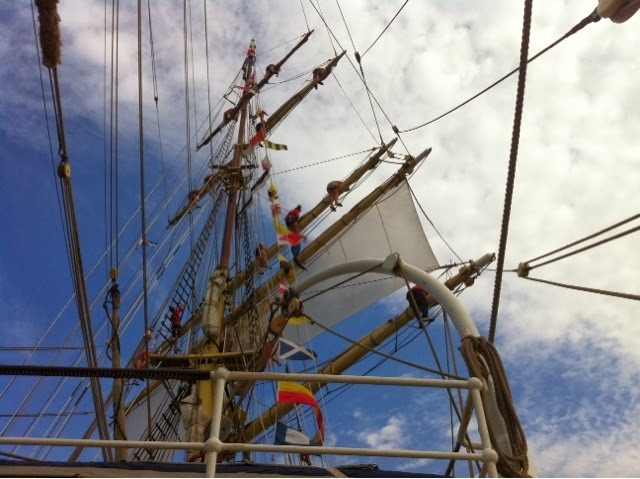 Another safe docking and we are in Cuba!